Got leftover mashed potatoes from your Thanksgiving dinner? 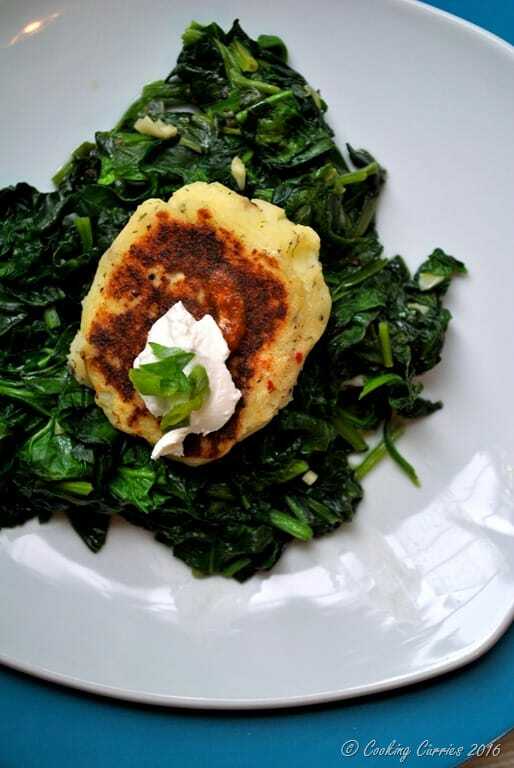 Make this delicious Mashed Potato Pancakes over Garlic Sautéed Greens for breakfast the next day! Hope everyone had a wonderful Thanksgiving surrounded by family and friends and everyone and everything you are grateful for. Here is a quick Thanksgiving leftover recipe to make for breakfast tomorrow. This one is from the archives. I made this sometime back, maybe a few months ago, for a brunch we had at home. We had a few friends over and I had made this Garlic sautéed Spinach topped with Mashed Potato Pancakes, Mixed Fruit Salad with Honey Lime Mint Dressing and Red Pepper and Scallion Frittata. 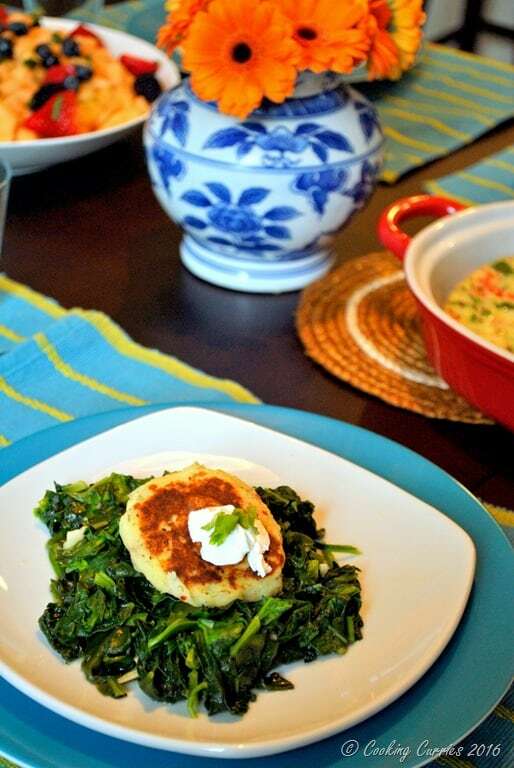 I first made this potato pancakes over sauteed greens after a Thanksgiving dinner a few years ago. I wanted to use up the leftover mashed potatoes in something for breakfast and made this quick recipe. It is especially easy to make if you have leftover mashed potatoes, otherwise there is that one extra step too. Inspite of that it is pretty simple to make and is healthy too. You can top it with a fried egg too, if you feel like it. 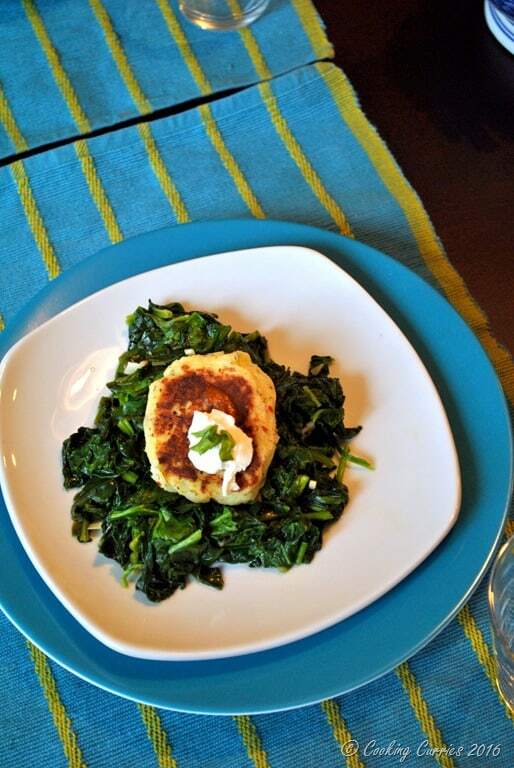 To Make the Garlic Sautéed Spinach – Heat the oil in a pan, add the crushed garlic to it. Stir well and add the spinach to it quickly, so as not to let the garlic burn. Add salt and pepper and sauté till the spinach wilts completely. Keep aside. To Make Mashed Potato Pancakes – Peel the potatoes and quarter them. Bring a large pot of water to boil. Add the potatoes with some salt. Cook till the potatoes are fork tender and drain the potatoes. Mash the potatoes well without any lumps and keep aside. Heat the butter in a pan on low heat. Mix in the potatoes, buttermilk, garlic powder, cheddar cheese, salt and pepper and mix well. Keep aside to cool a little. Heat a non-stick skillet to medium heat. Take a handful of the mashed potato mixture and pat it on your palm to form a patty. Place the patty on the skillet. Let it cook for a while. Drizzle some oil on it, if needed. Turn the patty around to cook the other side as well. Cook till it is golden brown on the surface. Repeat with the remaining potato mixture. 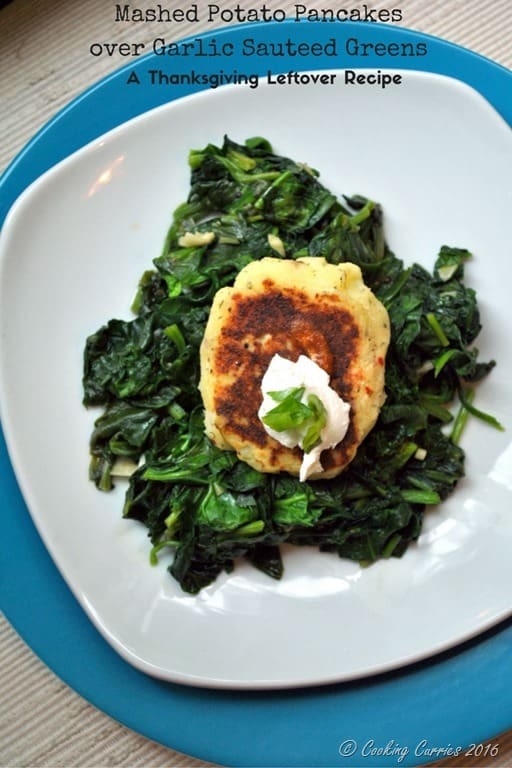 To Assemble: Place some of the garlic sautéed spinach on a plate and place a potato pancake on it. Top it with a dollop of sour cream and some chopped scallions. What a great idea! I have leftover mashed potatoes in the fridge right now actually!